"...A Modern Approach To Classical Music"
The Villa-Lobos-Duo holds an exceptional position in todayʼs music scene. The innovativeensemble in its rare setting fascinates audiences and stuns critics repeatedly with exquisite chamber music, breathtaking virtuosity and a unique sound. Experts rate the thrilling ensemble as the best of its kind worldwide. these categories get blurred. 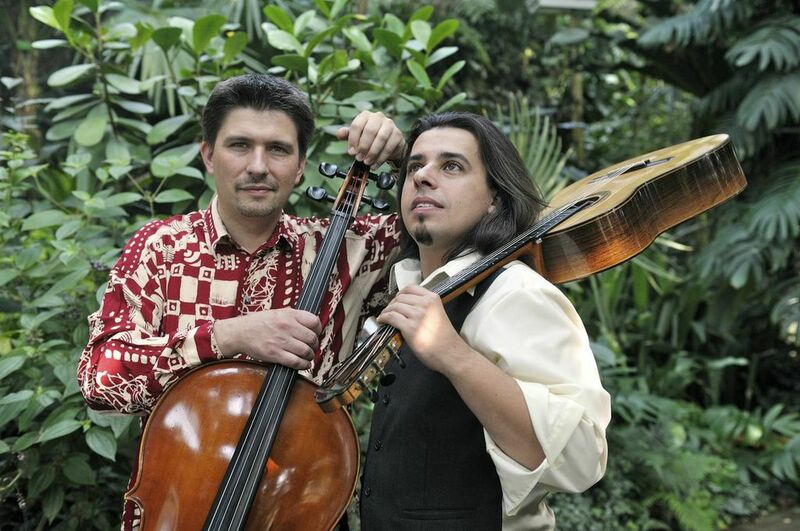 Ever since its foundation in 1992, the career of the Villa-Lobos Duo has been characterized by the constant search for new musical territory. The album juxtaposes first-class original compositions and excellent own transcriptions, haunting Jewish songs by Ernest Bloch and rhythmically rousing music from Yugoslavia and Bulgaria. A reminiscence of earlier days is the clever arrangement of the complete (!) “Bachianas Brasileiras No. 5”. The Villa-Lobos-Duo, which is made up of guitarist Boyan Karanjuloff and cellist Sven Holger Philippsen, has paid its respects on the 50th anniversary of the death of Heitor Villa-Lobos and released a tribute album called “The White Indian” and have created a genuine watershed in new classical music.